Osteonecrosis is a condition in which death of a section of bone occurs because of lack of blood supply to it. It can be a more rare cause of knee pain in older women, particularly over the age of 60. The exact cause of the osteonecrosis of the knee is unknown. However, one of the theories suggests that a stress fracture or trauma results in altered blood supply to the bone. Another theory says that fluid build-up within the bone increases the pressure on the blood vessels resulting in decreased circulation. If the condition is not diagnosed and treated early, it can result in severe osteoarthritis. 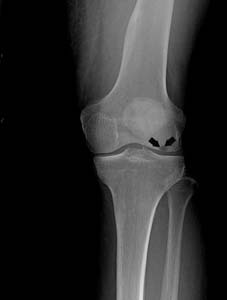 Certain conditions and treatments that are associated with osteonecrosis of the knee are obesity, sickle cell anemia, lupus, kidney transplants, and steroid therapy. Steroid-induced osteonecrosis affects multiple joints and can be seen in younger patient groups. Osteonecrosis in the knee results in sudden onset of pain inside the knee that is activated with a specific activity or minor injury. The pain worsens with activity and at night. Osteonecrosis may also cause swelling of the knee and sensitivity to touch and pressure and can result in limited motion due to pain and swelling. Stage I: The symptoms are most intense in the earliest stage and may subside in 6 to 8 weeks. In this stage, the X-rays are normal; a positive bone scan may be required to make the diagnosis. Treatment for Stage I disease is non-surgical, focusing on pain relief and protected weight-bearing. In the early stage of the disease, non-surgical treatment options that include anti-inflammatory medications, braces, strengthening exercises for thigh muscles and activity modification may be needed to reduce the knee pain. Dr. Patel will discuss all the surgical options and may recommend the one appropriate for you.